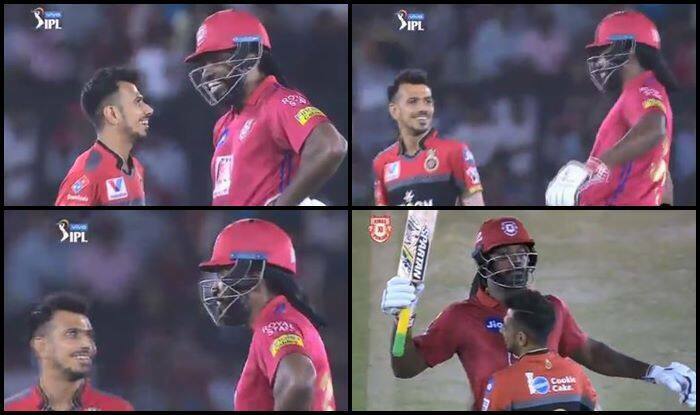 IPL 2019: Gayle was 61* off 44 balls at the time of filing the copy. IPL 2019: This is what happens when former teammates catch up! Ex-RCB cricketer Chris Gayle and Yuzvendra Chahal engaged in a mid-pitch banter at the Mohali stadium while KXIP was hosting RCB. It is hard to figure out what was spoken, but the two cricketers seemed to have enjoyed whatever was exchanged. Chahal with his two wickets has been the best RCB bowler, while Gayle has hit his fifty and is looking good to carry on and help KXIP get to a big first innings score. Earlier in the day, Royal Challengers Bangalore (RCB) skipper Virat Kohli won the toss and opted to field against Kings XI Punjab in their Indian Premier League (IPL) tie at the Punjab Cricket Association I.S. Bindra Stadium, here on Saturday.